Focusing first on the main living spaces, our clients opted to relocate the staircase that once separated the kitchen from the family room, creating a free flowing floor plan. Second to the architectural staircase relocation, widening the doorway between the family room and formal dining room furthers the open air feeling throughout the first floor. As the focal point of the room, the home’s original mantle and newly designed built-in storage adds character and visual interest and texture to the fireplace façade. 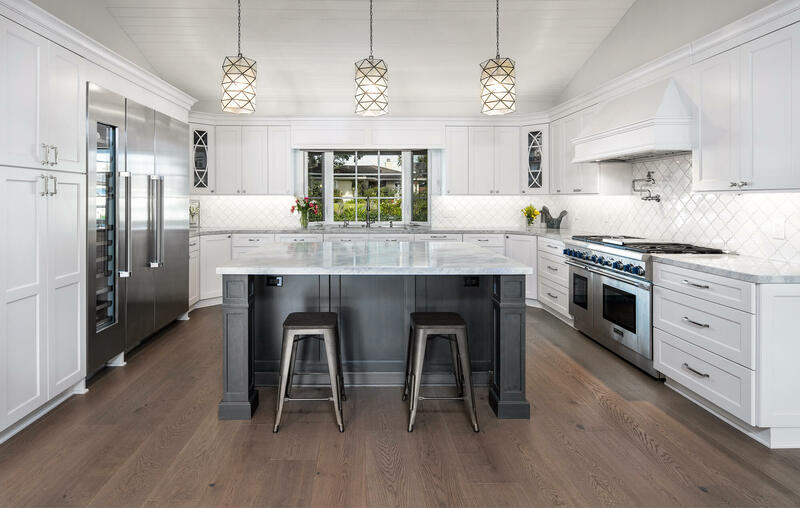 In the kitchen, the dynamic pairing of white painted perimeter cabinets with a wood stained “Smokey Hills” island sets a sophisticated design baseline. Durable enough to withstand the countless family gatherings and dinner parties ahead, Super White Quartzite countertops tie the two toned kitchen cabinetry together perfectly. Specifically incorporated to store the family’s KitchenAid Mixer and cookware, house the children’s snacks and organize the notorious “junk-drawer”, custom cabinet inserts keep things beautiful behind the scenes. Integrating a full size wine refrigerator into the cabinet plan was at the top of our clients remodeling wish list. Envisioning a playful element, a neutral, arabesque shaped tile backsplash to rounds out the space. 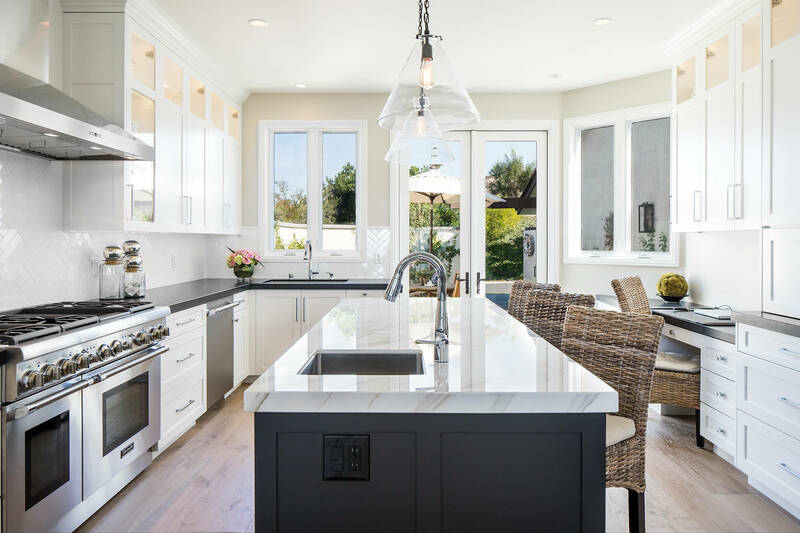 With their vision of the perfect Southern California beach home, these Corona del Mar residents trusted Sea Pointe Construction with their whole home remodel. With the structural reconfiguration of the kitchen, family room and entry way; our clients are now able to enjoy an open floorplan. The tiny kitchen that was once tucked back in a corner has blossomed into an entertainers dream. This large kitchen island, featuring a microwave drawer, prep sink and polished Neolith countertop is perfect for prepping, serving or dining. Paired with white perimeter cabinets, topped with a honed quartz countertop, this kitchen screams style. As we admire the tile mosaics in both the secondary and master bathrooms, the attention to design detail is very clear. 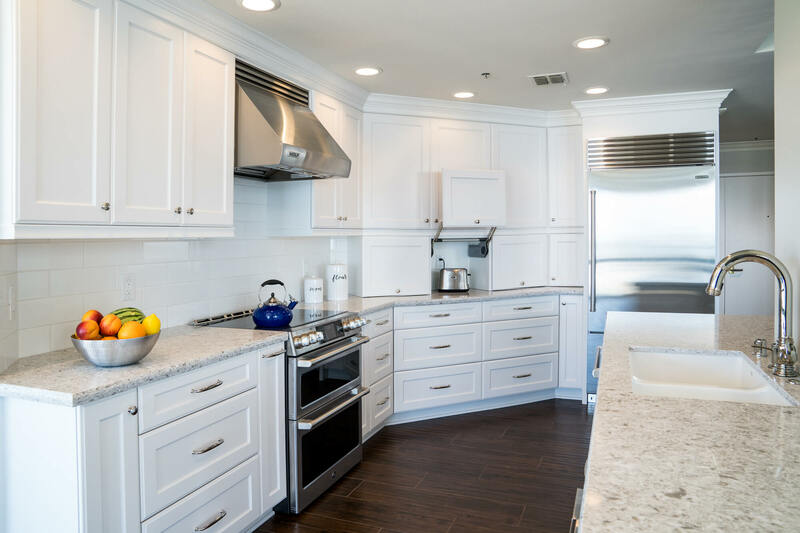 After years of enjoying their home, this Irvine couple turned to Sea Pointe Construction for a whole home remodel. Starting in the kitchen; our team was able to enlarge the entryways with minimal structural adjustments, adding a sense of space to this galley style kitchen. By mixing and matching cabinet door styles, our client’s desire for subtle yet stunning style was fulfilled. The farmhouse sink, brick backsplash and Dove colored custom cabinets work to make the space feel comfortable and inviting without compromising sophistication. The unique tile accents found on the walls of the powder and master bathroom is an unexpected surprise. This adventurous and whimsical tile sets these spaces apart while still seamlessly fitting into the blue hues of the kitchen and build in bookcase. Moving into the main living space, the reclaimed wood mantle, sliding barn door and porcelain tile “wood” flooring incorporate the best of the farmhouse design style. 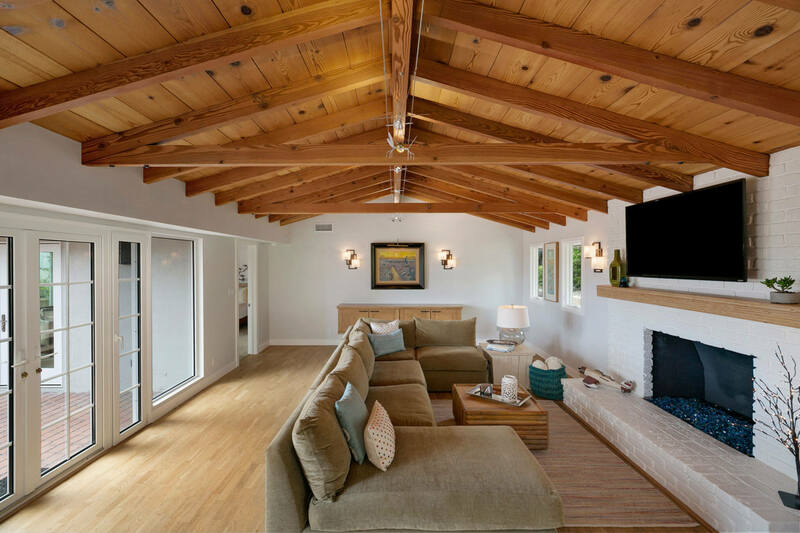 With a love for the natural wood look, this midcentury modern home was transformed into the comforting and inviting family home it is today. 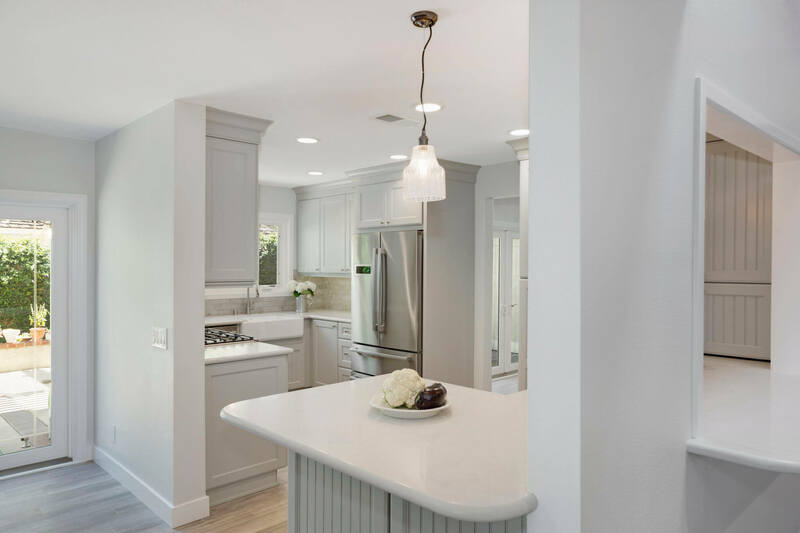 While keeling consistent with the overall transitional design aesthetic; each room in this remodeled home features a unique design element that takes the design from stylish to stunning. In the kitchen, we find a farm style sink that offers a fun texture element to the room. The eye-catching backsplash continues as we venture into the office area, admiring the ample storage designed to match the large kitchen island. Large windows allow for natural light, creating the illusion of a larger space. Designed for optimal functionality, this transitional master bathroom features a free standing tub, chic glass shower enclosure, and floating vanity fit for two. A cohesive whole home design does not mean that every room needs to look and feel the same. We encourage clients to play with different design elements to make each room feel unique.